To view reader ratings of all brands, Click Here. "Keeps up to 10 years in a dry location." "Unlike charcoal, you can safely add chunk charwood while you grill." "Caramelizes Foods' Natural Sugars To Seal In Flavors"
"Sprinkle a bit of vegetable oil over the charwood instead of lighter fluid to help you get your fire going." "Chunk Charwood", "All-Natural", "Martha's Favorite For Authentic Wood-Grilled Flavor", "Easy To Light", "Burns Hotter And Longer Than Charcoal", "Caramelizes Foods' Natural Sugars To Seal In Flavors", "100% Natural, No Additives", "Made Of Kiln-Fired Hardwood", "Adds Sweet, Mellow Flavor To Grilled Meats, Poultry, Fish And Vegetables", "Unlike Charcoal, You Can Safely Add Chunk Charwood While You Grill", "It's Easy To Grill With Chunk Charwood"
"Why Use Chunk Charwood Instead Of Regular Charcoal? Because it is all-natural. 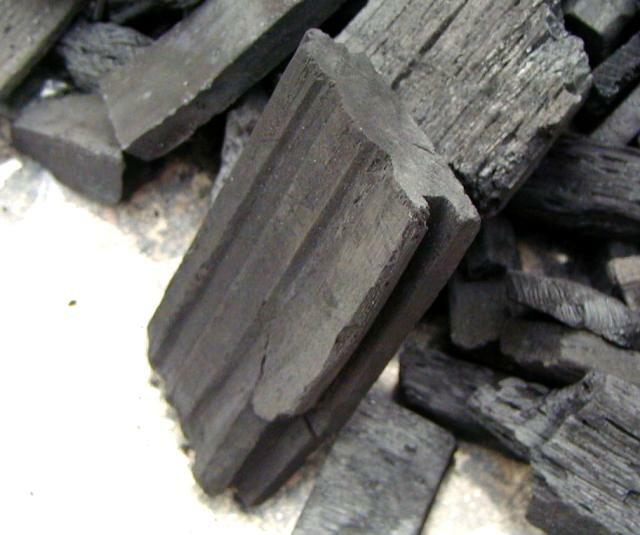 Traditional charcoal contains chemical additives and binders; chunk charwood is fired in kilns using natural grain alcohol instead of petroleum, which can leave residues on the charcoal. There are no emissions in chunk charwood, and its high heat burns more fat from foods than traditional briquettes. 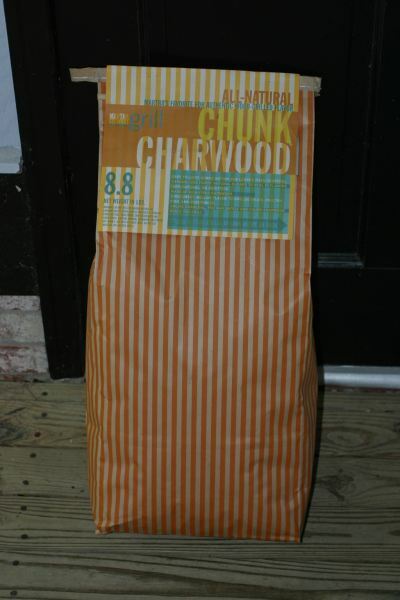 What Can I Cook With Chunk Charwood? Use chunk charwood when grilling meats, poultry, fish, and vegetables. Although chunk charwood usually cannot be used with a gas or electric grill, you can use our flavored wood chips with these types of grills for authentic wood flavor." "It's Easy To Grill With Chunk Charwood"
Chimney starters: These steel cylinders usually hold about four pounds of charwood placed on top of a few sheets of crumpled newspaper, which can be lit with a match. After the coals are hot, lift the chimney by its handle and empty it into a grill, where the coals quickly attain cooking temperature. Newspaper and/or kindling: Make sure bottom vents of grill are open. Crumple newspaper sheets into balls and place at bottom of grill. Dry twigs or kindling may also be used. Pile chunk charwood over newspaper and/or kindling. Sprinkle a bit of vegetable oil over the charwood instead of lighter fluid to help you get your fire going. Light newspaper and/or kindling with a match in several places. 2. After lighting, keep the grill uncovered and don't replace the grill's grate until charwood turns red. 3. Spread charwood evenly over bottom of grill, cover with the grill's grate, and start cooking. 4. Add charwood as needed for extended cooking. 5. Tightly roll down top of bag and reseal to keep out moisture. This is the contents of the bag. Those are 1 inch squares on the measuring bar. Here is a closer view. 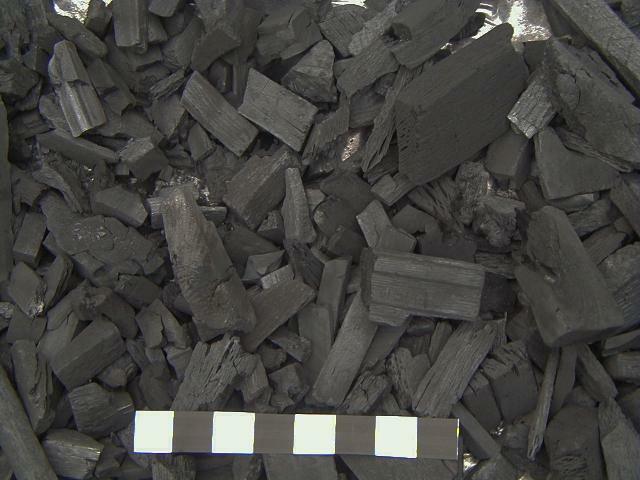 Here is an example of the types of scrap that make up this charcoal. How sweet! It's in a reclosable bag. No wonder, if you are going to keep it 10 years! If you are unfamiliar with our testing procedures, you may wish to read How We Review Lump Charcoal before reading this review. Also, you can read How We Score Lump Charcoal to learn about our scoring system. Prices listed in our reviews are current as of the date of the review. We do not attempt to keep these prices current. The conclusions and final rating given any charcoal are based upon the opinion of the author. We recommend that you use our rating only as a guide. You should read the entire review and decide what is important to you in making any buying decision. Images which can be viewed at a larger size have a small magnifying glass icon at the bottom right corner. Click on the icon to display the image in a new larger window. If you wish to ensure that you are seeing photographs the same way that we are seeing them, we recommend that you calibrate your monitor to a PC-normal gamma of 2.2. You should be able to see the difference between blocks A, B and C below, as well as the difference between blocks 3, 4 and 5. This review is protected by Copyright and may not be reproduced in part or as a whole in any electronic or printed medium without prior permission from the author. You can use the "Email The Whiz" link at the bottom of any of our webpages to contact us about using material from this review.